Also available at these fine book stores. Shop local! Cancer patients seeking to integrate meaningful spirituality with more than 250 practical healing solutions can now feast on a comprehensive blend of self-care options. Discover a variety of holistic strategies for cushioning chemotherapy and softening surgery while feeling empowered to grow in personal awareness. concludes with a useful healing ingredient. Explore these restorative ingredients to enhance your nutritional choices, stimulate your creative juices, foster your personal powers to transform mentally and emotionally, and deepen your connection with others and the Divine. “We have our first appointment with the oncologist on Monday. The course of treatment we are expected to have presented to us features aggressive radiation. “As I opened Thriver Soup, I flipped over a few pages, and stopped on page 79. Right there…outlined with specific questions for particular physicians…was the key to a much more successful/informative consult with the radiologist/oncologist. 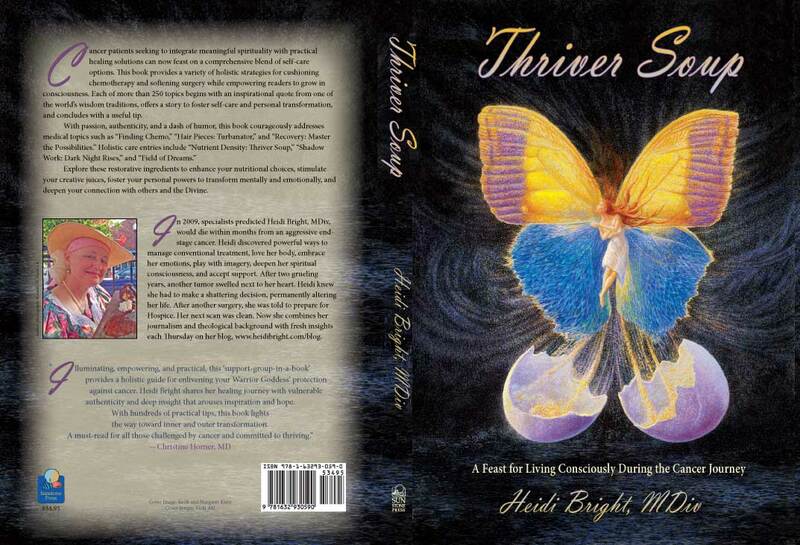 “Heidi’s book is already helping us in miraculous ways!! And, I really like the format she’s chosen – so much great advice is packed onto every page, but it’s presented in a casual, uncomplicated way. “It is comforting to the people who are concerned – even afraid – of their prognosis, because the text provides a plan and a focal point every step of the way. “Thriver Soup provides much-needed inspiration that cuts across religious lines for women diagnosed with cancer. “So many people in this culture feel, deep down, that they are fundamentally bad and deserving of illness; Heidi’s bright spirit radiates Basic Goodness and can be a source of comfort for anyone suffering or challenged. She communicates with an openness and vulnerability that will empower readers to accept and work with their individual situations.